There were so many photogenic sights in Italy that it was often tough to decide what to shoot – especially during the limited golden hours around sunrise and sunset. 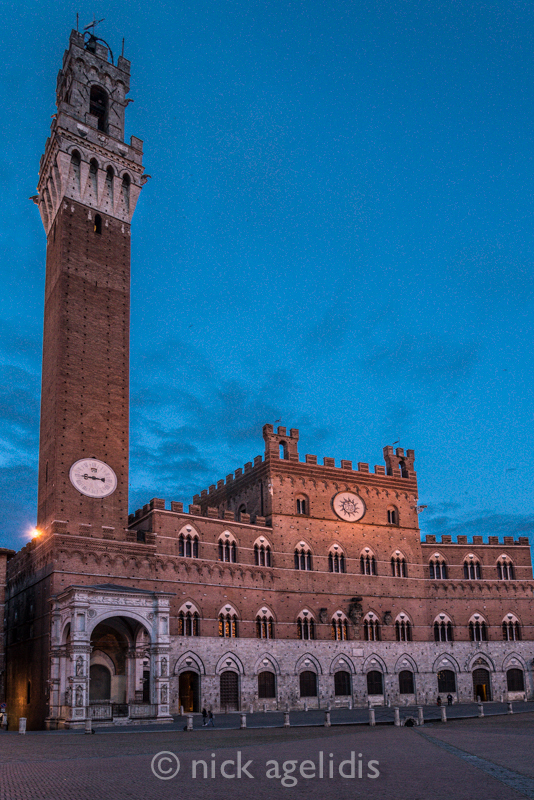 But with so much to choose from, I was often surprised to see groups of photographers with serious cameras and heavy tripods lined up and just waiting for half an hour for exactly the right moment to capture one particular iconic image, such as the setting sunlight on the tower in the Piazza del Campo in Siena. I guess they wanted to make sure that they nailed that photo – pretty much like everyone else around them; but in the meantime they ignored many other opportunities presenting themselves all around the piazza. Here’s the classic shot that most people got (mine is definitely not as good – for one thing, the “ideal” vantage points were already taken). But here are a few others I took while most people were waiting for the main one. Maybe the other photographers were there for the week and would be taking other photos on another evening, but I doubt it. Anyway, my point is that it’s a challenge not to be overwhelmed by the dominant image, and to continue to look for other interesting subjects. I don’t claim to be good at this, but it is something I keep telling myself to try to do. I’m sure there were hundreds more than the ones I found.